While butter and cheese make a great topping for gnocchi, there’s a plethora of ways to finish the fluffy, airy dumplings. Here, six of our favorites. Now that you know the easiest way to make gnocchi (thanks to F&W Test Kitchen genius Justin Chapple’s Mad Genius Tip), you’ll be making it all the time. While butter and cheese make a great topping for gnocchi, there’s a plethora of ways to finish the fluffy, airy dumplings. Here, six of our favorites. Mushrooms sautéed in garlic, shallots and thyme, mixed with white wine and chicken stock make a delicious sauce for extra-potatoey gnocchi. The key to John Besh’s creamy pan sauce is a rich crab stock, a splash of vermouth and a pinch of crushed red pepper. 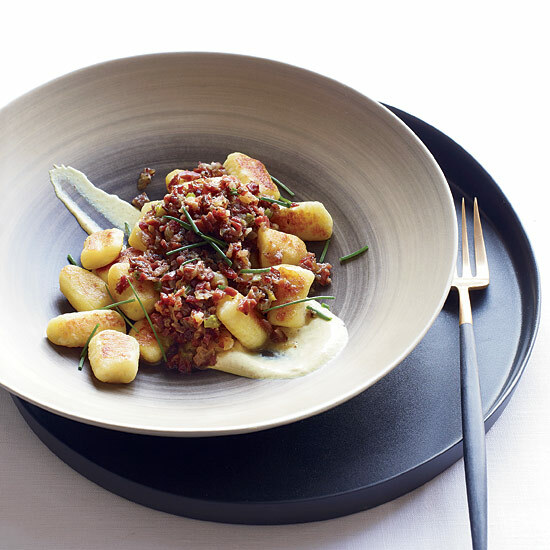 Snails add an earthy flavor to light and tangy fromage blanc gnocchi. Chopped pastrami makes easy work of a delicious sauce. Tangy green olives add an amazing dimension to comforting gnocchi. Bright and tart apple cider is the perfect base for a sauce for sweet potato gnocchi.